Whilst we were sleeping soundly in our comfy beds, Captain Yuri was at the helm navigating his way through watery fields of convoluted ice mazes through the night and into early morning. Our Captain and his officers barely slept whilst manoeuvring our sturdy little ship further south, and we are ever appreciative of their efforts. When the breakfast call came, we opened our eyes to the dazzling blue of Crystal Sound and not a hint of Ice jigsaw puzzle that had slowed our shop could be seen. To the Portside the shores of the Antarctica shimmered in their soft site undulating beauty whilst we sailed by ice burgs shaped like castles. Mid morning we gathered on the bow to mark our crossing the Antarctic Circle at 66 deg33.6 S. with the assistance of Christian we counted down the seconds. The ships horn blasted as we toasted with a glass of bubbles. Photos all round as we bathed in the precious Antarctic sun. After lunch we stepped ashore Detaille Island on the former British Research Station, known as “Base W” proved to be a fascinating glimpse into station life in the 1950s. Having been abandoned in 1958, it is a well preserved time capsule, illuminating what British scientists might have ate, read and lived. The vistas surrounding the island we’re breathtaking. On a nearby rocky outcrop we spotted a colony of Adelie penguins marching up and down the slopes looking busy and the waddled to a fro. Back on board the call was made to those brave souls to partake in the Polar plunge. Eighteen of our intrepid lot took to the icy waters of the Antarctic, whilst the rest of us looked on in wonder. 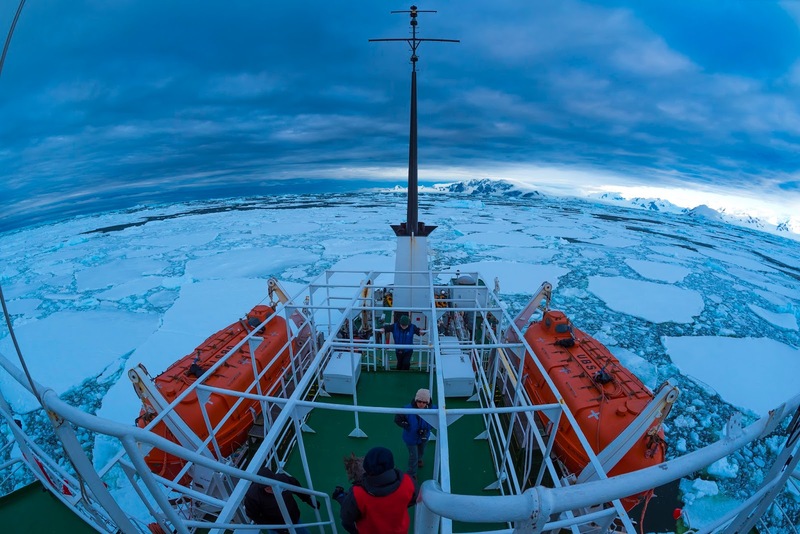 In the evening we dropped anchor in the surrounding sea ice. What a simply marvellous day in the Antarctica.